As Ana is hosting a Valentines Creativity Link Up I thought it was about time to post a couple of my recent projects. So get ready for some amateur sewing and photography. Here we go. As soon as we recovered from Christmas, and the craziness that is syllabus writing was in my rear view, I began to think about my teacher wardrobe. For the past three semesters I've only taught once or twice a week, but this semester I teach three times a week. And that, my friends, is a lot more outfits. Trust me. It is. I'm good at math. So while looking through my woefully ill-fitting wardrobe, I decided to sew myself something. A friend of mine had recently hooked me up with a bag full of fabric that she'd gotten for almost nothing at a garage sale, so this garment would only cost me a zipper. I found my tutorial here and gave it a go. I've never sewed anything more complicated than a pillow case, so this was promising to be a real challenge. But Jacob - in his Waldorfian glory - has a lot of sewing experience so I figured that with him on my left and internet tutorials on my right, I'd be able to manage. 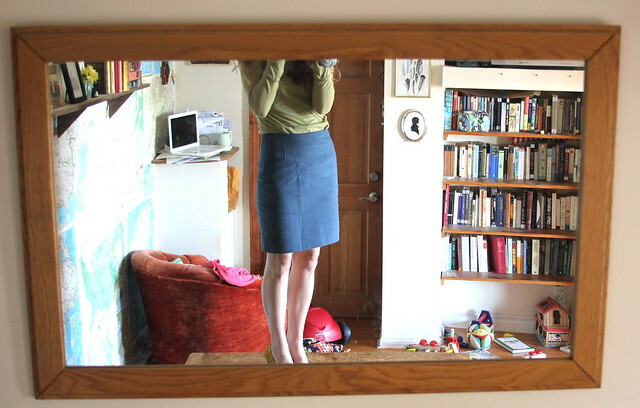 And after three naps and three night nights I had myself a skirt. I almost ironed it for the photo shoot. But then I didn't. Rudimentary darts? Check. 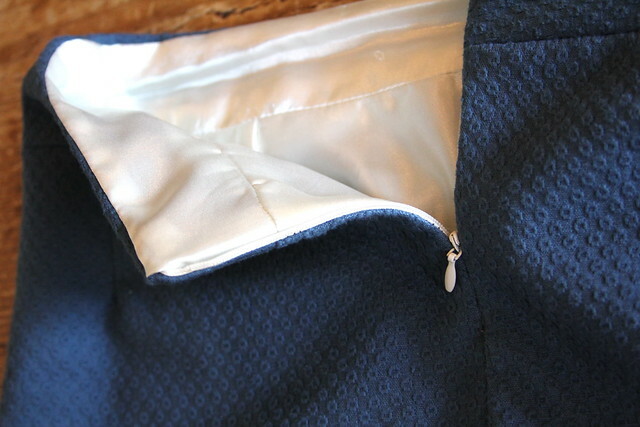 Poor seam to zipper transition? Check. A slit that's not quite tall enough and flaps up a little? Check and check. And here is the satin lining which makes me feel like Mammy from Gone with the Wind. And the zipper. The tears I cried. Not really. But it was a doozy. Enough pictures yet? No? OK. Here's another one of me standing on the table and awkwardly kicking up my leg. 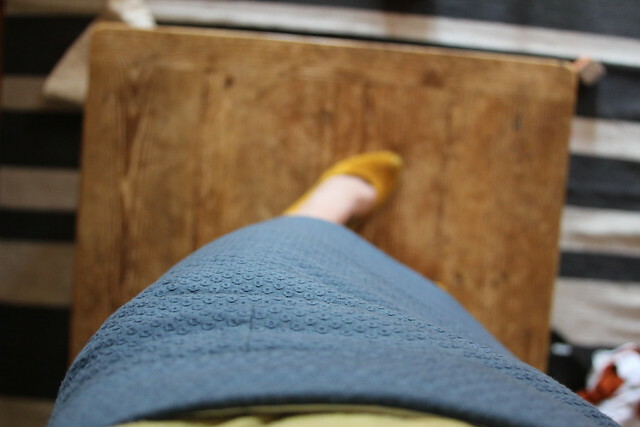 The skirt's been finished for about four weeks, and I've worn it about eight times. I haven't gotten a single comment on it, but I'm still crossing my fingers for the moment when I get to drop the "I made it" bomb, because despite its flaws - of which there are many - I'm ridiculously proud of it. I love love love embroidery and embroidering. Holding that hoop and all the stitches and colors. Now that this is done I'll probably embark on something a little more elaborate. But that might be after Easter when TV is no longer on the Lenten altar. Any. How. Happy Valentines day. Do something pretty and pink. Looks awesome! Great job! And you totally have runner's calves. P.S. Where ARE those shoes from? Both are awesome! I love the pillow and am TOTALLY with you on embroidery and TV it's kinda the only way I can do either one. Must be using hands and brain and eyes and ears at all times. I was reading this while holding my 2-yr-old who asked "whose that?" I said, "that's Kate" to which she replied "OH! I LOVE Kate!" but seriously, I am so impressed and so humbled that you linked a project this good and well executed to MY blog!! Seriously, both are amazing. But that skirt.. oh man, I am drooling, one day I will do something that awesome, when I'm 60 and go to Hobby Lobby daily to browse the isles. holy impressed. Seriously. WOW. I don't know which is more impressive though ... 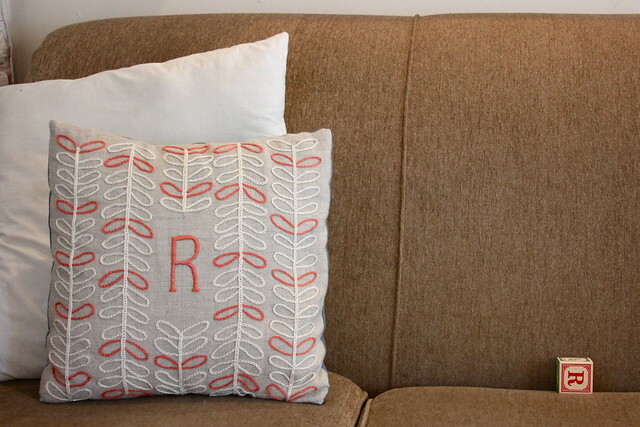 I thought "SURELY she didn't embroider that pillow ..."
and you are a TOTAL babe. as my college roomies would say .... "own it"
and I would also love to know where those shoes are from. Commentators - thank you for making my wife feel special this Valentine's day. Checks are in the mail. 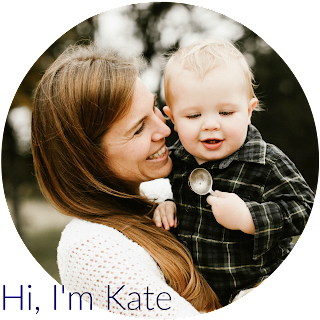 Katie, since I already had a chance to compliment your featured creations, I would like to shine a light on your impressive solo photo shoot. I'm impressed. See you in a bit. Can I make you dinner tonight? Lookie who's weighing in at The RL. I'd take you up on your offer for dinner, but because I'm a perfect wife, your dinner is already in the works. You can make me a feast on Sunday, complete with adult drinks, and I'll blog about it. ...and dinner on the table for bonus points. Way to go, babe. I may bring something to contribute. That skirt is awesome! And that pillow? Freaking amazing!!! Please let me in on your mad skills. Did you use a pattern or just your own talent? I am sorry I didn't say anything about it because you were wearing it last two times I saw you and I noticed it, admired it, AND remembered it. So impressive! And that pillow! Wow. Ugh. Stop being good at everything. It's insufferable. Wow you avoided allllll the blogger faux pas' of fashion shoots! (looking down, hunching shoulders, weird duck feet... the list goes on...) I'm super impressed! Also I love that you used the word "Waldorfian" to describe your husband. Amazing. oh my gosh! the skirt is amazing! so, so, so impressed! move over j. crew! and that pillow? i'm usually not inspired or drawn to embroidery but i LOVE it! That skirt is awesome! And looks great on you, too. Kate that skirt is seriously wow (as are those amazing yellow pumps). You look gahgeous. And I really do love love love that pillow. Why oh why wasn't I a better home-schooler when I had the chance...isn't sewing supposed to be one of their fortes? And Jacob I know I'm late to the Valentine's Day commenting, but do I get a check too? I LOVE your skirt! You hottie. 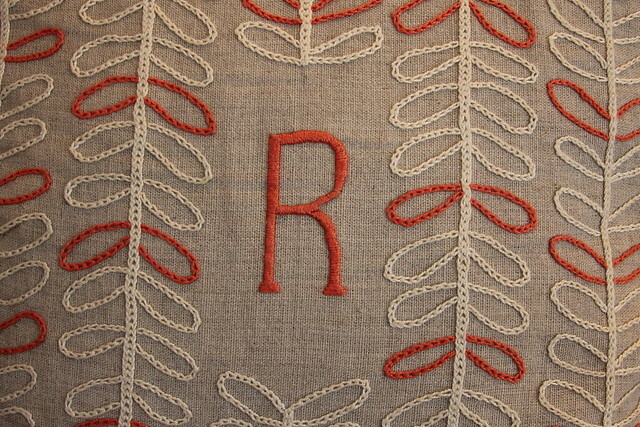 Also, I TRIPLE love the pillow, and enjoyed the fact that there is a little "R" block sideways on the couch. I bet the reason you haven't gotten comments on the skirt is that it just ties the outfit together seamlessly and the overall effect is magic, so much that one element does not stand out more than the rest. Except your legs, perhaps. Nice work. Maybe I should try embroidering so that I can watch more TV. Holy crap. 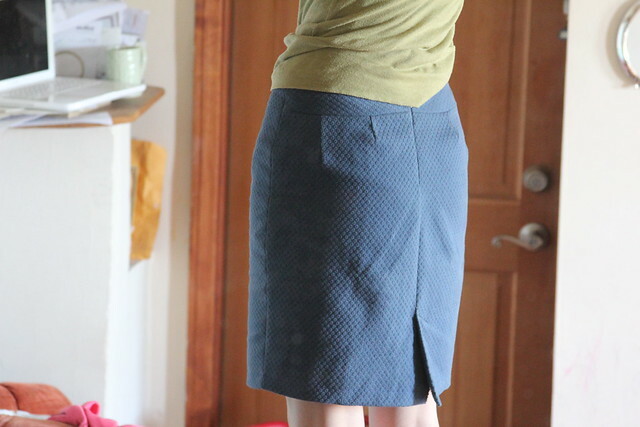 I can't believe you made that skirt! I didn't know one could make skirts like that when one is not a professional seamstress. And that pillow is so beautiful! Did you come up with the design yourself or were you pinspired or something? I'm super impressed. Bravo! 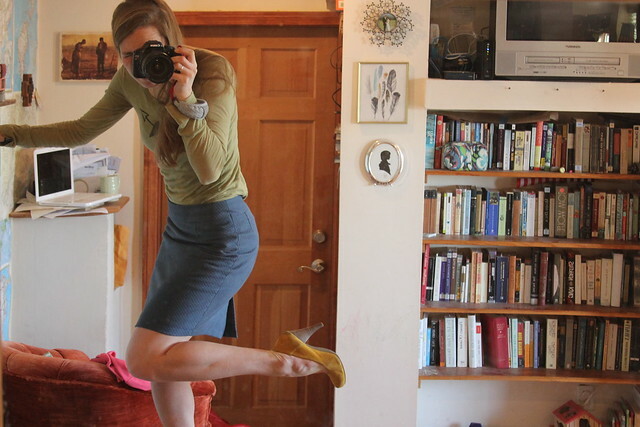 BTW, I'm going to assume you have a cobblers bench and you made those adorable yellow shoes as well, because they're as stunning as the pillow and the skirt. Oh my gosh!!! You are the cutest! I LOVE the skirt and the pillow is so insanely adorable. I want you to teach me embroidery now! And the pillow is fantastic. I'd buy it at a fancy store no problem! They are so precious I could just feel their soft cuddliness. Have a great weekend. Love all the Customised baby wear, they seem personal and thoughtful.